enable online appointment availability and scheduling. With MD Insider’s Call Center Solution, call center agents can do a fully integrated search for providers including key areas like availability, insurance, experience, quality, distance, affiliation, and much more. Full backend EMR integration allows call center agents to not only check availability, but to also book appointments directly from this integrated solution. Convert more visitors into patients by providing powerful physician search and scheduling on your public-facing website and mobile devices. Make scheduling an appointment with your doctors as easy as possible, with MD Insider’s easy-to-use provider search solution and improve the ROI on your marketing campaigns. 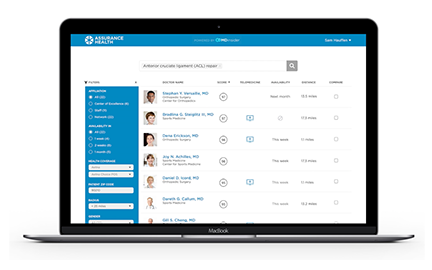 Reduce leakage by providing your physicians with an easy-to-use physician match solution that lists their fellow health system providers whose experience, outcomes, insurance and location best match their patient’s needs. MD Insider’s proprietary platform is loaded with a comprehensive database of more than 850,000 doctors and billions of rows of claims and clinical data. This enables health systems to provide users with an enriched physician directory that includes precise details about every doctor in their system. Agents can use common search terms to precisely match patients to the right doctor the first time; this is not a self-declared list of specialties but a data-driven profile that details experience, quality and efficiency. Agents can go beyond the standard “doctor directory” information to have integrated availability data and even the ability to quickly schedule appointments without leaving the physician matching screens. MD Insider has done the hard work of integrating insurance plan information of every doctor into our database. Your agents don’t have to waste any time looking at multiple data sources. Health systems can leverage MDI’s performance & quality analytics and also add other parameters to prioritize search results and schedule appointments.